Here at Blenheim, we are very proud to be offer some fantastic Music Services. 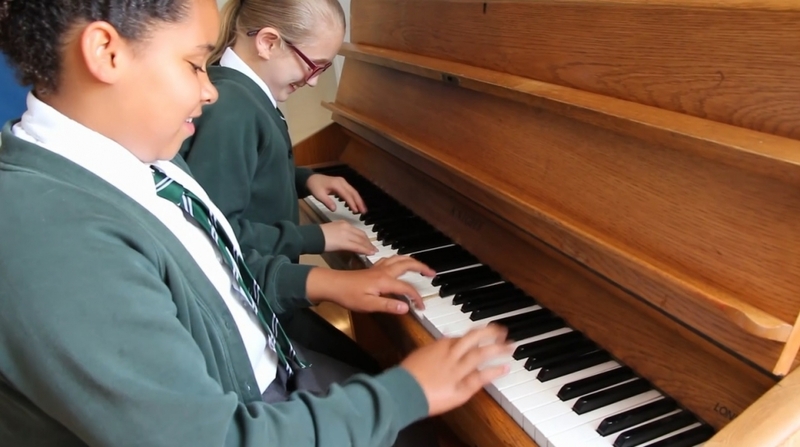 In addition to our growing school choir who have featured at local events, borough-wide recitals and perform regularly for members of our wider community, pupils at Blenheim also have the opportunity to learn an instrument. Working very closely with the Bexley Music Education Hub (Bird College), children at Blenheim have the opportunity to begin learning an instrument from Year 3. The instruments we offer include: cello, violin, viola, trumpet, trombone, flute, oboe, clarinet, piano and percussion. We are currently planning on increasing the number of instruments we offer, so do keep checking here for further updates! Research has shown that learning a musical instrument not only improves study skills such as dedication, practice and commitment, but that it also has impact on learning generally across all curriculum areas. Furthermore, learning a musical instrument gives learners an opportunity to be creative, to perform and to be confident and is proven to have a positive impact on mental health and well-being. At Blenheim, we recognise this and thanks to the government’s First Access programme and working collaboratively with Bird College, before leaving our school, all pupils will have the opportunity to learn an instrument as part of their curriculum studies as a whole-class. Please note however, our specialist music teachers do get booked up very quickly at the beginning of the Autumn Term; in the event where we have too much interest in a particular instrument, your child will be added to the waiting list and you will be informed should a space become available. However whilst waiting, where possible, your child will be offered an alternative instrument within the same orchestral family. First Access Whole-Class Teaching – no fee to parents. Small Group Instrumental Tuition: £5* per week (for approximately a 20 minute lesson) for a period of 25 weeks. (Please note however if you are learning the drums or piano, the cost is £7.50 per week due to limited group numbers). Instrument Hire: Instruments can be hired from Bird College at £60 (for violas and violins) and £69 for all other instruments. This includes a £20 refundable deposit on the safe return of the instrument in the same state it was leased. Unfortunately the school and Bird College are unable to lease Drums or Pianos. However we can refer you to alternative providers to purchase practice keyboards and drum pads. What if we as a family cannot afford the lessons?